We hold a wide range of events bringing together ecologists and policymakers, from large-scale conferences to panel debates and focused workshops. Our workshop identified priorities, challenges and opportunities to shape our engagement with Brexit during 2017, and to inform the work of our Brexit Policy Working Group. Workshop report by Rick Parfett, Policy Intern. This report summarises the discussion held at the BES Scottish Policy Group Pie and a Pint, on the 26th October 2016 in Inverness. The event was open to all BES-SPG members and policy relevant people. About 40 people attended from wide range of organisations. The group then split into four, with each group taking it in turns to address the four questions. The report summaries the key messages from each of the four groups. On 20th April 2016 the British Ecological Society’s Scottish Policy Group ran a ‘Pie and a Pint’ (PAAP) event on the topic “Beyond Protected Areas”. The document presented here is a note of the main themes and points raised during the evening’s PAAP discussion; it is not a minute of the meeting but hopefully accurately captures the balance of ideas and opinions presented. Lloyd Austin – Head of Conservation Policy for the RSPB in Scotland. Following on from the presentations, the attendees split into four groups; the four speakers rotated between the groups every 10 minutes. The discussion from each group is written up in the report note. This symposium brought together the ecological research community and those involved in policy and government, to assess the value and applicability of a range of techniques for improving the decision making process. By working together, we aimed to enable delegates to get greater impact from their research, and to improve policies and practice. At our 2015 Annual Meeting, we held a public debate on GM crops, with speakers Pete Ritchie (Nourish Scotland), Helen Sang (Roslin Insitute), Joyce Tait (Innogen Institute), Rob Livesey (NFU Scotland) and Heather Ferguson (University of Glasgow). Chaired by Alan Gray (Centre for Ecology and Hydrology). Do ecosystem approaches deliver for biodiversity conservation? A joint workshop of the BES Scottish Policy Group, External Affairs Team and the Scottish Biodiversity Strategy’s Science and Technical Group. Our workshop at the 2016 Annual Meeting explored the tensions between biodiversity conservation and a focus on ecosystem services, in the context of Scotland’s 2020 Challenge for Biodiversity. Hosted by The Sibthorp Trust, The British Ecological Society and the Chartered Institute of Ecology and Environmental Management (CIEEM). 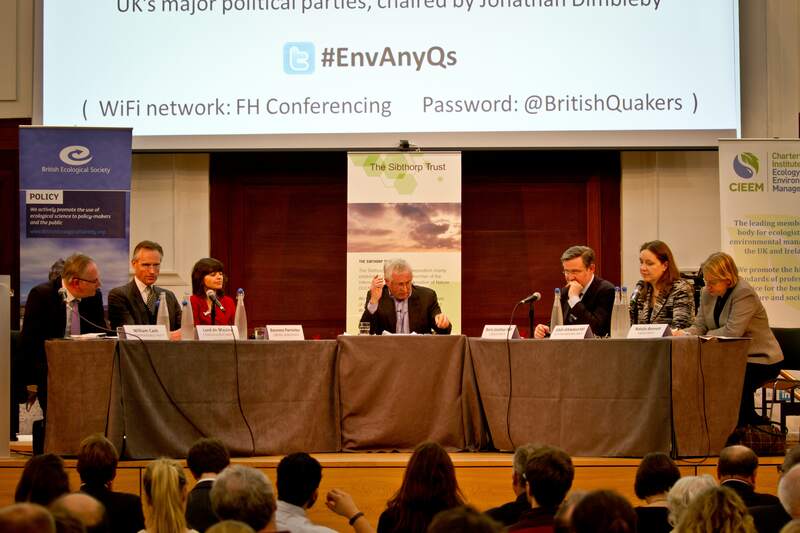 People, Politics and the Planet: Any Questions brought together a panel of leading politicians to debate their environmental policies ahead of the 2015 UK general election, chaired by Jonathan Dimbleby. Communicate recommendations for ways forward across the sectors.